Today’s off the beaten path adventure will take us slightly inland, away from the coast, into Emek Hefer. This valley of kibbutzim and moshavim, just to the east and north of Netanya, will give us the opportunity to stroll through eucalyptus groves on the banks of the Alexander River while watching large turtles sun themselves on the rocks nearby, and have lunch at a boutique wine shop/ restaurant at an adjacent kibbutz. However, we’ll start our day at Israel’s largest collection of orchids located at Utopia Park and end it over a cup of coffee or glass of wine at a cliffside Bauhaus restaurant overlooking the Mediterranean. From Tel-Aviv travel north on Route 2 to the Netanya junction, Route 57. 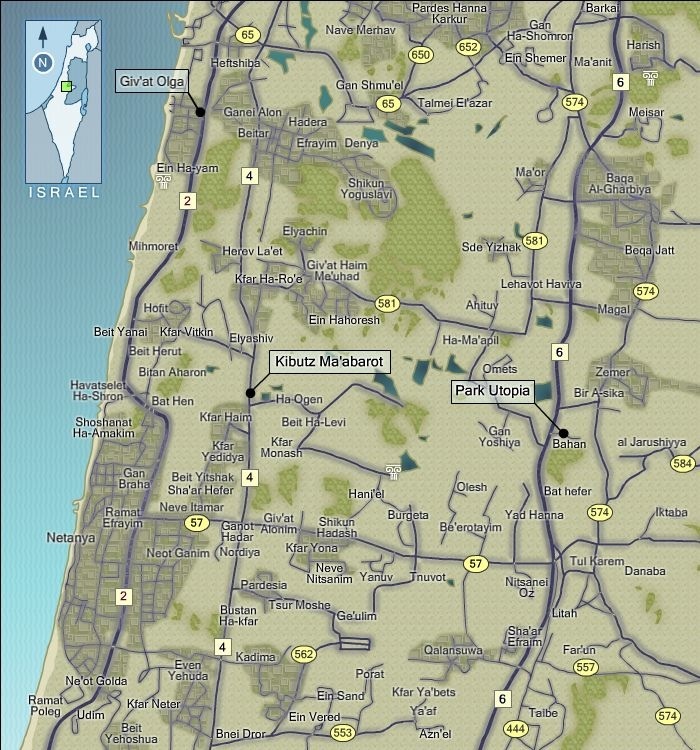 Travel east on Route 57 for about 15 kilometers, following the directional sign to Kfar Yona. As you reach the Nitzane Oz junction turn left and follow the signs to Kibbutz Bahan.The trip from Tel-Aviv may take you 45 to 60 minutes. 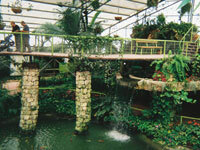 Their parking lot is spacious and Utopia Park is accessible to the physically challenged. During the summer months the park is open from 8:30 a.m. to 6 p.m., but closes at 5 p.m. during the winter. On Fridays the park closes at 3 p.m. Noteworthy is the fact that the 4000 square meter orchid hothouse can be enjoyed rain or shine. You can reach the park by telephoning 09-8782191.Guided tours for school children, with explanations in Hebrew, English, Russian and Arabic, can be arranged prior to a visit, and Utopia Park has also become a popular venue for corporate events in Israel. After paying the admission you’ll be ushered into a darkened cave to watch an informative animated movie. 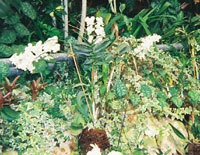 From there follow the sounds of cascading water through the waterfall entrance of the humid, glass covered arena of orchids, ferns, peacocks, pools and bridges. Take your time to stroll down the paths of this tropical jungle to admire the thousands of orchids on display while stopping to read the educational signs nearby. Utopia Park boasts one of the world’s largest collection of orchids including 50 species and 100 varieties, among them the paphiopedilum, cymbidium and cattleya. As you meander through this “Garden of Eden” listen to the sounds of parrots, the clucking of hens and the chirping of other exotic birds coming from a caged area that you can enter with a tour guide. Though it’s hard to take your eyes off the colorful orchids and other tropical plants, do look above to admire the large ferns, the coconuts hanging from the palm trees and the colorful bananas near the amphitheater. Near the exit, stop at the collection of carnivorous plants, whose rootless early existence in a swampy environment forced them to adapt to a life of fly and insect catching. It’s now time for some fresh air with a stroll through the Utopia Park outdoor gardens or a rest on their expansive lawns. Your kids will no doubt enjoy the delightful topiary, the butterfly garden, petting area, or just running through the maze hill. As you exit the park, think about a brief stop at the garden center for a souvenir plant or cutting to remind you of your visit to Utopia Park. Now let’s retrace our way back on Route 57 to Route 4 where you will turn right and travel about 3.7 kilometers . Turn left and follow the sign to Kibbutz Ma’abarot and the Alexander river. Then follow the road a short distance to the right and park your car near the river. The Alexander River was at one time considered to be one of this country’s most polluted streams as it collected sewage near it’s source in Nablus and in other areas of the Palestinian Authority before flowing into Israel. 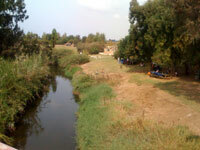 However, in 1994 an initiative between local governments in the Palestinian Authority, the KKL/JNF, and Israeli governmental agencies, known as the Alexander River Restoration Project, resulted in the remediation of the pollution and the creation of park like setting along the river bank. This level of collaboration between Israel and it’s Palestinian neighbors may very well serve as a model for future similar cross-border initiatives. 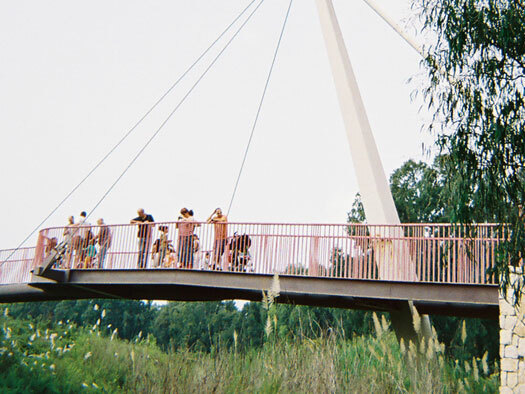 Today, with the additional assistance of the Italian Jewish community, the rehabilitated area is known as “Parco Italia” and affords visitors the opportunity to hike, bicycle and picnic along the river’s edge. Walk along the pedestrian bridge, or on the trail with its limestone pavers and shaded sitting areas, north toward the wooden observation platform to observe the many large soft shelled turtles and fish in the stream. You may also see some Grey Mullet, which are common to the Mediterranean Sea, after they have breached the sand barriers of the estuary to lay their eggs upstream on the banks Alexander river. If time permits, you may wish to follow the excellent signage and continue to hike toward the coast along the river edge with its abundance of lush vegetation. On your walk, note the four small dams which were built as ladders to facilitate the travel of fish down stream. In the spring, you’ll have the joy of experiencing blooming anemones, tulips, buttercups and other colorful flowers on a hill near the eucalyptus grove. By now you have no doubt built up an appetite, so it’s time for lunch! Drive back into the gated entrance of Kibbutz Ma’abarot, follow the road to the left down the hill and look for the wine shop sign. The shop has a large variety of Israeli boutique wines, international selections as well as wonderful Belgian, Czech and German beers which will go well with your lunch.You may be greeted at the door of the Beit HaYain cafe by it’s owners Baruch and Riva Wolf who have created a delectable menu of quality cheeses, seafood and meats. Baruch is a friendly kibbutznik who started his career as a manager at Ma’abarot before opening in the renovated old storage building a rustic gourmet eatery. You can enjoy your meal on the wooden veranda or outside surrounded by gardens, a small vineyard, eucalyptus trees and rural landscape views. On a rainy winter day you may want to try Baruch’s goulash soup, beef bourguignon, with a slice of apple strudel for dessert to boot. 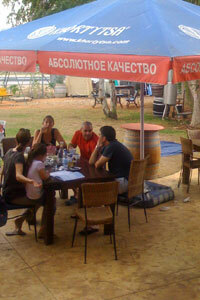 The restaurant is open daily and for larger group reservations Baruch can be reached at 09-8972053. If you would now like to savor a good glass of wine with a view of a Mediterranean sunset, and are ready to travel another 15 minutes north on our Israel tour for a bit of history, then let’s visit Beit Hankin (04-621 4424).This small gem of a restaurant, with it’s terrace overlooking the aqua waters and beach, was built in Bauhaus International style in 1936 by Yehoushua Hankin for his wife Olga. Today, this restaurant is the centerpiece of Hadera’s largest neighborhood known as Givat Olga and is a nice little place to visit during your tour in Israel. Yehousha Hankin is best remembered for his tireless efforts in purchasing large tracts of land, on behalf of the World Zionist Organization, the Jewish National Fund and other organizations, in what is today Rehovot, Hadera, Acco, the Jezreel Valley, and Emek Hefer. His knowledge of Turkish law, fluency in Arabic, and intimate knowledge of the customs of the local Arab population, complemented by the strength of his personality, permitted Yehousha to successfully negotiate transactions valued at hundreds of thousands of dollars with absentee Arab land owners in Beirut and Damascus. In 1888 Yehousha married Olga Belkind, who had arrived in Palestine two years earlier, with a degree in midwifery from the University of St.Petersburg. Olga was twelve years his senior, and used her many years of experience in midwifery to assist Yehousha in developing personal relationships with Arabs living in the vicinity of their home in Jaffa. She soon made a name for herself in her own right as a midwife to the families of local sheiks and other Muslim and Christian notables. Olga and Yehousha were exiled to Turkey during the first world war, and upon their return to Palestine Olga retired from midwifery. She however continued to live in her husband’s shadow for many years thereafter, and was buried in an ornate mausoleum built by Yehousha at Mt. Gilboa in the Jezreel Valley. 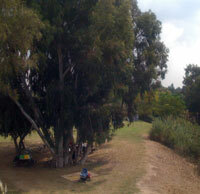 There on a hill, next to her grave, is a Bauhaus structure identical to the cliff-side restaurant at Givat Olga. As you enjoy the setting sun from the terrace at Beit Hankin, take a few moments to examine the large collection of photographs inside the restaurant of the pioneering settlers of Hadera, the surrounding Emek Hefer, and the Hankin and Belkind families. 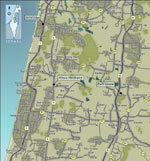 At the conclusion of your visit you can easily return to Route 2 for your drive to Tel-Aviv. To reach Beit Hankin follow Route 4 into the town of Hadera, and at the circle, follow the sign to Givat Olga. Follow Shim’oni street to the railroad tracks where it becomes Aaron Aaronsohn boulevard. Half way around the next circle turn right into Hashalom street, and after a few blocks, follow the signs toward Tel-Aviv and proceed over the Route 2 viaduct. Then follow Menachem Begin street to the beach. Park near the very large, unfinished concrete building, and walk through the gate and along the path until you view a small white cliff-side building on the left.